Tax Day Round-Up The long distance runner: Lonely, no more? Three decades ago homeschooling in Virginia was legally questionable and rare. But since the Code of Virginia was amended in 1984 to specifically allow for homeschooling, the number of children educated at home has grown steadily. When the Virginia Department of Education first began counting the number of homeschool students in 1989, there were 3,000 students. In 2012, there were 33,000, making up more than a quarter of all children not enrolled in public school in Virginia. • Provides a program of study or curriculum delivered through a correspondence course or distance learning program, or in any other manner. • Provides evidence that they are able to provide an adequate education for the child. At the beginning of the school year, parents fill out a short form notifying the local school division that their children will be educated at home with a list of subjects to be taught. At the end of the school year, the parents have to provide evidence that their children have made sufficient progress. Though homeschooling was once considered something of a fringe phenomenon, the U.S. Department of Education survey data shows that a wide variety of families now homeschool. Income levels for homeschooling families are similar to national levels. In over a third of homeschooling families both parents work, and 1 in 13 homeschooling families are single parent families. Students who are taught at home often take classes outside the home as well. In Virginia, over half of all school divisions allow homeschool students to enroll part time in public school classes. Research on how home educated students perform academically has been limited but generally positive. Two major studies in 1998 and 2009 showed that home educated students scored well above average on standardized tests, but both studies were hampered because the participants volunteered for the tests rather than being selected. Accepting the studies’ results does not necessarily prove home education is superior. Parents who homeschool are deeply involved in their children’s education, and children of such parents perform well at public and private schools too. Statewide, 2.5 percent of all K-12 students in 2012 were educated at home. On the school division level, the percentage of students educated at home varies significantly. Rural school divisions, where the bus ride to school might be particularly long, often have much higher rates of homeschooling than the statewide rate. In largely rural Surry and Floyd Counties, over 10 percent of students were educated at home in 2012. Urban school divisions, in contrast, typically have homeschooling rates well below the statewide level. Some rural counties with particularly high rates of poverty, such as in Southwest and Southside Virginia, also have low rates of homeschooling. Though the number of students who are educated at home in Virginia has grown considerably since the 1980s, the growth has been steady, not rapid, increasing consistently by about 1,500 students each year. Despite homeschooling becoming easier, thanks to clearer regulations and innovations in instructional technology, it still requires a significant commitment from the parents, which means the number of homeschooled students is not likely to increase quickly. 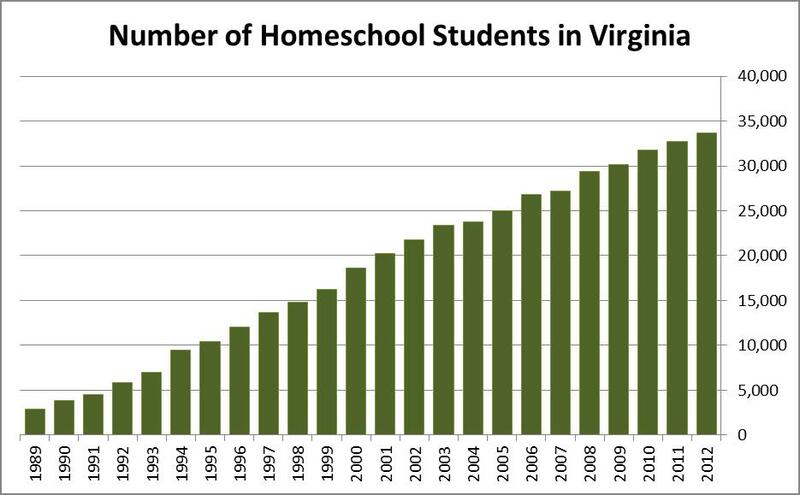 However, in Virginia, the number of homeschooled students has continued to increase since the 1990s, despite two recessions and little growth in Virginia’s total school-age population. Though the 33,000+ home educated students in Virginia make up a small portion of the 1 million+ students in the Commonwealth, if they were a school division, they would be the 8th largest division in Virginia, after Henrico County and Chesapeake city. In many rural counties in Virginia, homeschooling already contributes significantly to the counties’ education systems. While homeschooling is still a small part of Virginia’s total education system, given the decades of steady growth in the number of Virginia’s homeschool students, it is likely that homeschooling will eventually play a bigger role in Virginia’s education system.